The idea was originally mooted by Tom Watkins, East 17’s larger than life manager, who also happened to be a comic book aficionado. 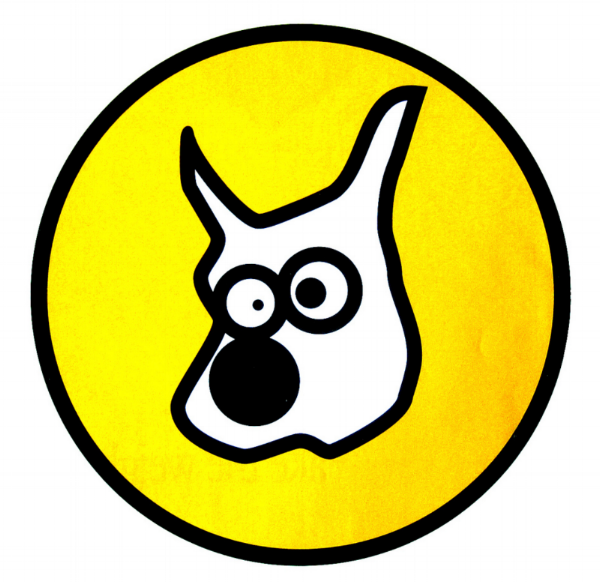 Form duly created Bob Dog, a 1990s icon that developed something of a life of his own. In fact, the boss-eyed dog of indeterminate breed became so loved and familiar that its features could be distilled down to just its eyes and ears, and yet still be instantly recognisable. West says there were two official variants of the circular logo — one a simple black line drawing on white, the other sporting a ‘Kodak’ yellow background (above). The eyes have it: just a few simple lines were enough to create a good Bob-ness. Image courtesy of Form ©2017. But from this, all kinds of versions, spin-offs and applications were possible. For example, on the back cover of East 17’s debut album, ‘Walthamstow’, there were four versions of Bob, based loosely on each member of the band. Bob’s face also graced the cover of the single ‘House of Love’, an inspired, if somewhat counter-intuitive move for a ‘boy band’. Bob even had an occasional sidekick called Gordon. All in all, he was a merchandiser’s dream, making his way on to duvets, pillowcases, crisps, and much more besides, all scrupulously managed by Form. Dog’s best friend: original marked-up artwork featuring Bob and his PMS 3C mate Gordon. Image courtesy of Form ©2017. Bob was brought to life in typical old-school, pre-Mac fashion. Initial pencil sketches were inked in by hand using Rotring pen and then enlarged on a PMT machine. The dog’s: marked-up artwork for East 17’s debut CD single, ‘House of Love’, featuring Bob Dog on the front cover. Released in August 1992, it spent six weeks at number one in Sweden. Image courtesy of Form ©2017. Tom Watkins upped the ante by insisting that the band got themselves a real dog. So in a case of life imitating art, Levi the Staffordshire Bull Terrier joined the pack. Everything fitted together. Famously, one of London’s last-remaining dog racing tracks was in Walthamstow E17, the band’s manor (it closed in 2007). And if the lads appeared a little rough around the edges, their association with Bob (and Levi) helped position them as loveable rogues. The real thing: Levi photographed by Lawrence Watson. Image courtesy of Form ©2017. So why the name? The boys in East 17 used to call each other ‘Bob’ instead of ‘Mate’ or ‘Bro’ — Walthamstow street banter. Form picked up on this and co-opted the name for their mascot. And it seems there's life in the old dog yet. Adele was recently spotted sporting a bomber jacket with a Bob patch on the back. West Norwood’s finest is a big East 17 fan apparently. Someone like you: Adele takes Bob Dog for a walk. Many thanks to Paul West @ Form for his time and help in putting this post together. We hope he’ll be contributing some of his own words to BLJB soon. You can see Form's more recent work here.